FULLERTON (2-1-17) — The visiting Grossmont College Griffins stacked up a 4-2 win over previously unbeaten Fullerton on Tuesday (Jan. 31) in Orange County. The Griffins took a 1-0 lead as MICHAEL DIFFLEY scored on a wild pitch. 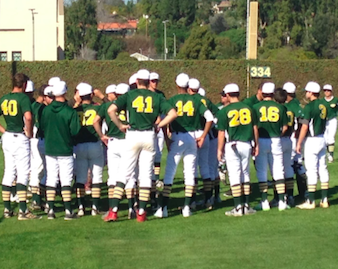 After Fullerton tied the game in the third inning, the Griffins rebounded for 3 runs in the fifth inning keyed by a home run from DAVID MALDONADO – a left field shot over the left field fence put the Griffins in front to stay. The fifth inning continued when NOAH STOHL doubled to center field to drive in a run to make it 3-1. NICO NAVARRO followed suit as he cashed in Diffley. The Griffins (2-1) featured solid pitching led by DONAVON McCRYSTAL (1-0), who allowed 2 hits and 1 run. TREVOR ROW, MATTHEW TAYLOR, COOPER COPELAND, JEREMIAH BARR each pitched one inning to save the victory. Noah Strohl advanced to second on the throw; Michael Diffley scored on a wild pitch. John Zanze advanced to second; Joey Parente advanced to third; Ryan Aguirre scored on a wild pitch. David Maldonado homered to left field, RBI. Noah Strohl doubled to center field, RBI; Niko Navarro advanced to third; Michael Diffley scored. Cabot Van Til grounded out to 2b, RBI; Noah Strohl advanced to third; Niko Navarro scored. Austin Case grounded out to ss, RBI; Joey Parente scored on the throw.